Our sixteen year old son responded with this answer when I questioned if he felt “cheated” that many other kids received allowances and he didn’t. A question that has been asked of me numerous times is, “How do you handle allowances with your kids?” I want you to know up front that this is a highly debatable topic and in no way do I have the one “Golden” answer. It varies for each family, their financial situation, and the temperament of the children. What I do know is that every parent needs to figure out a path to teach their children the value of money and give them the tools to understand how to manage it responsibly. Not only that, but this training needs to begin sooner than later. We begin talking financial responsibility as soon as they are able to whine for candy in the check out line. Unfortunately, too many children of this generation are being raised with a “entitlement mentality.” Somehow there’s a sense that they are owed something and often times deserve it for nothing. So what does that have to do with determining an allowance? Allowances can blur this attitude if definite boundaries are not thought through and established before an allowance system is put into place. I’ve heard of too many parents who give a set weekly $$ amount to their children just for being part of the family, but what reason are you giving? These parents may determine that out of this money, kids need to pay for their clothes or fast food/snack purchases etc. If there are set boundaries for that money, it’s a good way for them to learn money management. If it’s just given, that’s where allowances might spoil children. In our family, there are basic core chores that our children are expected to do for free because they are part of our family unit. Believe it or not, I do not want allowance tied to these basic family chores because in no way may they think they have an option of not doing them. After that, there are commissionable chores put into place where they can earn and learn if they go above and beyond the basics, but we never did a set allowance. I have mixed feelings about that, but considering our financial circumstances at different times, it’s just not something we strictly implemented or could afford. I feel it’s crucial though to have tools in place to allow your children to earn money, set financial goals and manage their own money, you just may need to be creative with this. As children get older, parents run into problems with allowances because kids tend to weigh their circumstances and decide that they would rather skip their chores for a measly $10. How will you handle that occurrence? How do you handle allowance for your children? Click on over to the comments and let’s learn together. 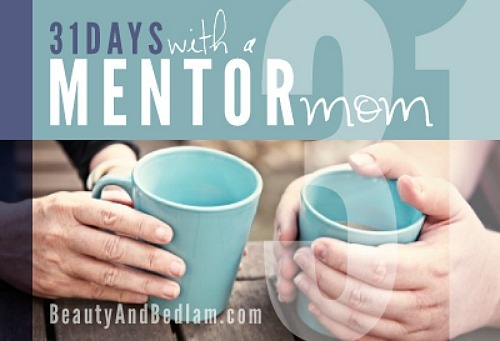 For more topics from this mentor mom, continue browsing. We offered an allowance for our sons from the time they were old enough to do weekly chores on their own and they were in school. We paid them based on their age…so when they were 8 years old they received 8 dollars a week. Some may find this high but we also built in an incentive to save. For every dollar that they saved, up to half of that amount we guaranteed them that we would matched it. All of their savings remained in their account until they graduated from high school. They all had money to either buy a car or go gone on to college. Whatever money they didn’t save they were free to spend as they wanted to. BUT they were expected to buy their gifts from this money when birthdays, holidays came around. What we found was that they learned HOW to save and balance their funds. Today my boys are 24, 28 and 32 and they all do well with money as far as saving and balancing their checkbooks and paying their bills in a timely fashion. For some this may seem very steep…but we could afford it and we looked at it as they were contributing to their higher education and appreciating it. This took away that “entitlement” issue for a higher education. They also gave to church every week without us having to ask them and they continue to voluteer and give today. I have always felt that if we do not show our children how to handle their own funds then when they get out on their own, they do not have the tools to be successful. I don’t have kids of my own yet, but I have worked as a maid/ nanny for several families and I serve as a children’s minister as my church, so this is a topic that comes up frequently. What I tend to see is the result of overindulged kids with a sense of entitlement as it rears it’s head during Sunday School week in and week out and I pray for parents as they deal with this issue. Here’s what my parents did and as far as I can tell it worked. (although I guess it was a different time and economy). We were expected to do regular chores with no pay. And, we were given an allowance ($1/ week all the way through high school). This was “just b/c we love you” money and out of that we were encouraged to tithe. We were also expected to pay our own way for anything extra….example- when I wanted to start wearing make up I had to save up a couple of weeks in order to buy it myself. Occasionally (especially before the holidays) we were given the option of some extra heavy chores for pay. We were also encouraged from a young age to find work. I babysat 3 hours every Saturday morning from the age of 9. We learned very early on to value money and to really think about what we wanted to do with our limited income. We’ve tried a number of methods but here’s the one we’ve settled on….we give an allowance of $1 per grade level (3rd grade gets $3). That is their money and not tied to any chores. They get it regardless of behavior or participation in family chores. However, they are routinely asked to do various chores around the house and as part of the family, they are expected to do that chore right away. The consequence of refusing or forgetting is to pay me $1 for each incident. That has only happened twice per child. They do have opportunities to earn extra money for more involved chores (generally a day of yard work). And we do require them to “work off” the cost of special activities that we pay for. For example, one is going on an extended Scout trip this summer. We want him to have the opportunity and can afford it but we require him to do more for the family to earn that trip. Our kids save their money and periodically make donations to different organizations on their own. My stepson was one of the “Felt he deserved it all” kids till I came along. He receives a fixed allowance of $10.00 a week (paid in full at the end of the month) and It comes with a price. I keep a chart and when things are not done a dollar comes off. He loses something we paid for he is obligated (no negotiations ) to replace it. Breaks something because of doing something wrong (an expensive statue of mine) he replaces it. He is not paid for cleaning his own room or for looking after his dogs that is obligated. He also saves 20% to buy gifts for parties he attends or for family members for birthdays and such even if only a card and 2% to the donation jar. I wanted to teach him respect for those around him and their belongings and get rid of the I don’t care attitude. I couldn’t agree more about not having allowance tied to chores. There are certain things that all members of our family must do to keep our home neat, organized and running smoothly. That’s just part of being a family. We start giving allowance in kindergarten ($2 per week)…our children are allowed to save some of it for any toys, books, etc they may want. They are also required to put a set amount of their allowance into their savings account each month and give a set amount to the church offering. This system works well for us! My method surely isn’t perfect, I’ve wondered about the best way to do it myself. My girls are 10 and 11 and each get $5 a week. It isn’t tied to any chores (although they do have regular chores) and I use it to limit the “I wants”. When they want something at the store, candy, lipgloss, sunglasses, a trinket they find at Goodwill, etc, I always ask them if they want it bad enough to use their money and if they do they buy it, I don’t. It has really limited what they ask for and seems to make them realize how quickly small items add up. We tried different systems for both chores and allowances, but the one I feel worked best is what I call the “Marble Jar”. I purchased one large glass jar and filled it with marbles, then a smaller glass jar for each child. My husband and I sat down and wrote a list of chores that needed accomplished and assigned a marble count to each chore according to the time and effort required…or sometimes, the ‘yuck factor’. Feeding the cat was 1 marble, cleaning the litterbox was 3 marbles. The size of the smaller jars was such that 70 marbles filled it up. The children were expected to accomplish 10 marbles worth of chores each day. The caveat was this, if mom or dad *asked* them to do the chore, no marbles were earned. We were in a financial situation that allowed us to pay as much as the children earned, the rule was that when the jar was filled, they received $10, and there was no limit on the number of times they could fill it during the week…it was seldom that they filled it more than once a week though. Like Alicia, above, the children used their earnings to pay for their ‘wants’. My totally unsolicted advice is that if you do not institute any other controlls over the allowance you pay, institute this one…many ‘needs’ become unimportant if the children have to use ‘their’ money to pay for them! Once our children start working, we use a different method of helping them learn to manage their money. 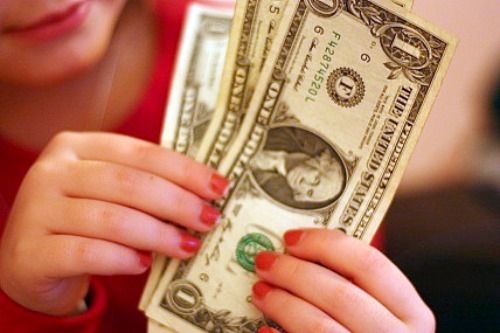 When our children were younger we decided that we would give them $.50 per week per year they were old. So our 6 year old got $3 each week. This was not tied to any chores. We explained to our children that in our family everyone has “responsibilities” and everyone has “priviledges”. Work to keep our home running is the responsibility of each member of our family. Spending money (or allowance) is a priviledge. We required that the children’s money be divided into 3 parts – 10% for tithing, 20% for saving and 70% for spending (or saving for something big). My kids are still pretty young- 5, 4, 3 & 1 but we just started our 5 year old with a $.75 weekly allowance. We want to teach her early about money and how to handle it so each Friday she gets three quarters and puts one in each envelope- Save, Spend & Give. She brings her Give quarters to church to put in the giving plate. The Spend quarters she can spend at the stores when she wants something so it could be something from the quarter machine(usually the toys not the candy) or if she waits 4 weeks she can get something from the dollar section at Target. She looks forward to getting her quarters every week but she usually isn’t too concerned with spending them right now. We haven’t set up anything specific that she will use her Save money towards but I’ve just told her that it is good to save money for big things like how Mommy and Daddy have to save a lot of money in case we need to buy a new car which is a lot of money. Our son is almost 7 and does not receive an allowance. He does have daily chores he does around the house, as do my husband and I – we believe that’s an important part of being a family, you don’t get paid to do it! When he does want to buy something, we sit down and discuss the item, cost, and the impact on our family budget. If we do buy the item, he most often gives up something in exchange or helps out with an extra project around the house or for an extended family member (such as helping his grandmother with her recycling). I personally think that if you teach a child well they should do some chores for the household just because they are a member of the household. In addition if they do extra credit work it should be out of the kindness of their own hearts (then if they have done such a great job you wish to give the some cash for the extra effort then that is the way I handled these efforts) if the did a sloppy job just in the hopes of extra effort cash I did not pay cash. In addition they can grab a snow shovel and shovel a neighbors walk if the neighbor wishes to pay them for the effort then I say they can accept if the neighbor just say’s Thank you then it is volunteer time. Raking leaves , washing cars etc… selling baked goods door to door. Getting a real job in the real world is hard work and some of your money goes to taxes , some goes to basic needs. Might as well learn these lessons while young. Also just because you get a job does not equal you get to keep the job for life. My boys 12&13 get $10 each weekly. No problems so far. I didn’t pay my boys for chores … I paid for attitude. Chores had to be done, regardless … but only if they were done cheerfully, without griping, did the boys get the cash. They are now fine young men who work without complaint, and they no longer even ask for compensation.